During my day-to-day activities, I use the Bash shell a lot. My #1 policy is to optimize the most frequently used activities as much as possible, so I’ve compiled these handy bash shortcuts and hints (tested in SecureCRT on Windows and Konsole on Linux). The article only touches on the default bash mode – emacs, not vi. If you haven’t specifically assigned your shell mode to vi (set –o vi), you’re almost certainly using the emacs mode. Learn these and your shell productivity will skyrocket, I guarantee it. For quite a while now I wanted a tool to maintain a list of my domains and monitor them for expirations and registration state changes. Having a spreadsheet didn’t cut it anymore but thanks to Joel’s question on stackoverflow, I found DomainTools monitor. Domain Status like "registrar-lock", "redemption-period", and "pending-delete" changes will be sent to you so you can take action when your favorite domains are about to be released. Domain Registar changes are a sign of domain transfers which are detected by Domain Monitor. Posted by Artem Russakovskii on December 18th, 2008 in Stuff, WTF? I’m now convinced that insurance companies exist in this world for the sole purpose of making our lives a living hell any time we need to deal with them. The worse each experience, the less likely we are to file another claim. Of course, we’re also less likely to continue coverage with the same company, but at that point they’d already received our money and, if we accept a notion that most insurance companies have the same evil idea in mind, there’s little one can do to get satisfaction. Except for one thing – spread information about such especially heinous institutions. Peteris Krumins is nothing short of a technical genius. Every single one of his blog posts is so detailed, one can write a book about it. He blogs about Linux, programming, and other tech stuff on his blog http://www.catonmat.net/. There were 3 phone interviews and 5 on-site interviews. Peteris flew in all the way from Latvia, fully sponsored by Google. They paid for his flight, hotel, transportation, and food – brilliant! This is a great read by NY Times. An article on 6 pages rarely gets my full attention but this is one of them (though I detest the usage of "basement hacker"). Basement hackers and amateur mathematicians are competing to improve the program that Netflix uses to recommend DVDs — and to win $1 million in the process. "THE “NAPOLEON DYNAMITE” problem is driving Len Bertoni crazy. Bertoni is a 51-year-old “semiretired” computer scientist who lives an hour outside Pittsburgh. In the spring of 2007, his sister-in-law e-mailed him an intriguing bit of news: Netflix, the Web-based DVD-rental company, was holding a contest to try to improve Cinematch, its “recommendation engine.” The prize: $1 million. 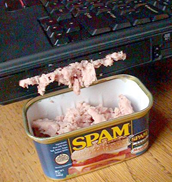 Everyone hates spam, right? Right, well maybe except for security researchers – it pays their bills. But the rest of the sane world does, and so do I, and while gmail has figured out a way to deal with the problem 99.9% of the time, nobody invented instant messenger anti-spam solutions yet [I think]. Lately I have been getting increasingly annoyed with a certain unexplainable, persistent, and surprisingly intelligent botnet on AIM. From time to time I would get messages from some sort of a fish variation. My list so far consists of the following IM names: CroppedCoho, FortifiedTrout, FreshenedupTrout, FrozenSolidTrout, HandcuffedCoho, KissableCoho, PreferentialCoho, SmarterCoho, TentativeCoho, WantedCoho, and YoinkedTrout. Does it look annoying already? Well, it is. This is insane. Probably the best Halloween light show I've ever seen. Best part starts around 0:50. 3:53 is great too…. I’ve been meaning to post this for a while: a friend of mine by the name of Thaya took this picture at his office recently and shared it on nowthen.com. I love office pranks, and this one is world-class! Check it out. Kudos to the Coral8 team. I’d like to share this relatively new video that shows Google Android’s mutli-tasking capabilities and the seamless integration of these capabilities. Hey, it’s got a copy/paste too (eat that, iPhone!). Android is an OS that’s got a clue. I applaud Google developers for thinking ahead. You can view more videos from the Android/Google developers here….
.: 78 queries :. : 0.158 seconds to generate cache :. : nexus2 :.